This Greek Revival church in downtown Greenville was built in 1858 and is one of the city’s oldest public buildings from the mid-nineteenth century still in use. The church was founded in 1831 with ten charter members; the congregation, originally known as Greenville Baptist Church, first built a meeting house-style sanctuary for worship. 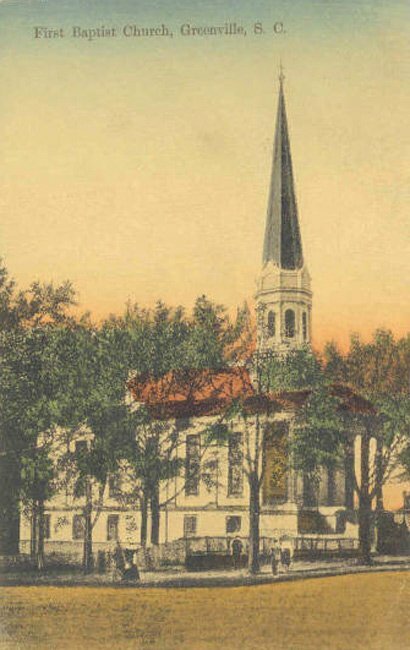 When Furman University – which at the time was Baptist-affiliated – relocated to Greenville from Edgefield in 1851, the church increased significantly in membership. 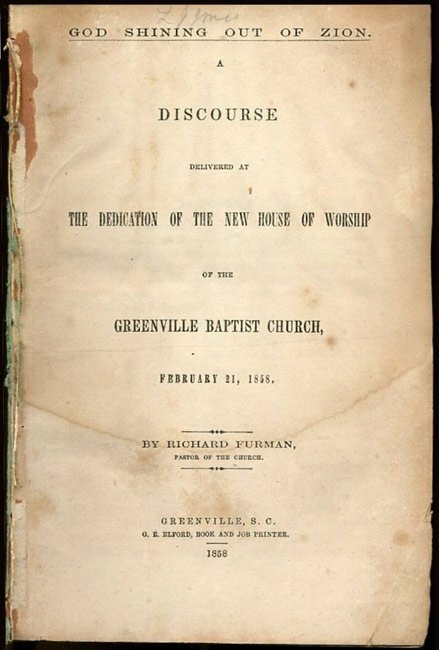 In 1852 Dr. James C. Furman, then-president of the school named for his father, the Reverend Richard Furman, commented, “I wish the Baptists of the state would show the same wisdom which the Episcopalians of the low country do in putting up attractive buildings in important places in the up country.” Two years later Greenville Baptist Church formed a building committee and began planning the stately edifice seen here. When this church was completed in 1858, not only did membership continue to grow, but the denomination itself gained an even stronger presence in Greenville. The Southern Baptist Theological Seminary operated from Greenville until 1977, initially meeting in the church’s first building. 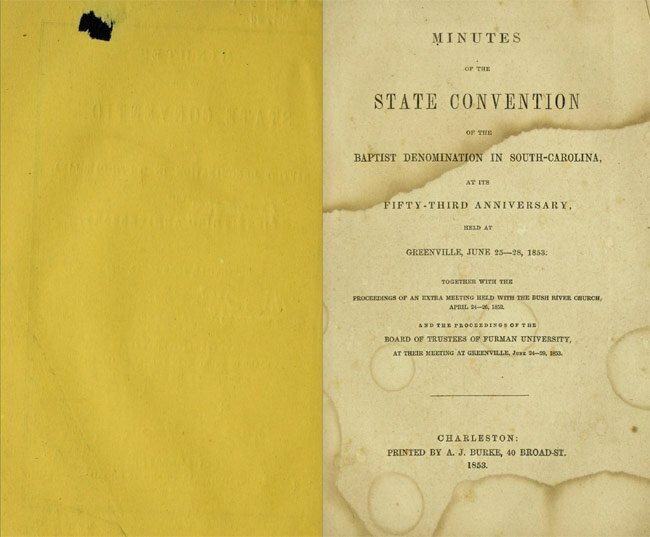 In 1882 Greenville Baptist Church hosted the Southern Baptist Convention, and by 1889 it had held eight sessions of the State Convention. In 1890 the congregation changed its name from Greenville Baptist Church to First Baptist Church. By the 1950s the church had a membership of 2,500 and continued to increase. Such growth mandated several additions throughout the twentieth century, and finally by the 1970s the congregation had completely outgrown the historic building. First Baptist Church built a larger church on Cleveland Street and relocated to the new sanctuary, and those who remained in the older church organized a separate congregation called Downtown Baptist Church. In 2011 the church was renovated and reorganized yet again, this time as a campus of Grace Baptist Church, an Upstate nondenominational church with eight locations across the South Carolina Piedmont. The former Downtown Baptist Church is now called Grace Church Downtown. 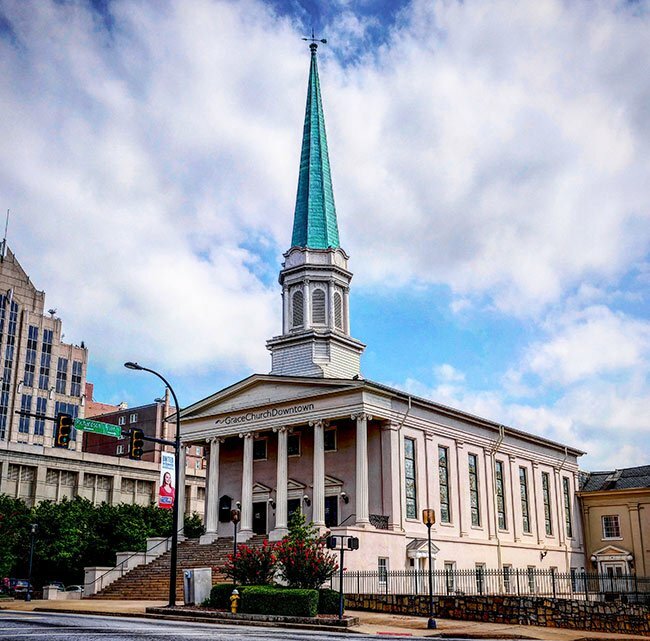 (Greenville First Baptist Church) For many years Greenville has been a stronghold of the Baptist denomination in the state, and the Downtown Baptist Church has been one of the focal points of that strength. Downtown Baptist Church is a large Greek Revival structure constructed in 1858. The church was designed by Samuel Sloan, noted architect of the mid-to-late nineteenth century. Set upon a high raised basement, Downtown Baptist Church features six Ionic columns supporting a pediment and tall central spire. It is constructed of brick covered with stucco. Numerous concrete steps lead to the portico which has three double glass entrance doors, each capped by a pediment. Above each entranceway is a window with vertical mullion. The side facades have six bays separated by pilasters, each bay featuring a stained glass window. On the basement level there are 8/8 windows and an entranceway. Alterations were made to the exterior facades and interior ca. 1915. Building additions were completed ca. 1914, 1940, 1950, and 1957. By the 1970s many in the congregation felt the need for a larger building. At that time a majority of the congregation moved into a new building, taking the name of First Baptist with them. A sufficiently large group chose to remain in the older structure, and in 1974 they organized as Downtown Baptist Church.